WASHINGTON, DC — Leaders from the International Hearing Society (IHS) expressed their frustration this week in an email circulated to the organization’s members on July 22, which was obtained by Hearing News Watch. The ongoing congressional lobbying efforts by IHS towards the passage of the Veteran’s Access to Hearing Health Act of 2015 (H.R. 353) and its US Senate companion bill (S. 564), to achieve a new provider classification for Hearing Aid Specialists within the Department of Veteran’s Affairs, hit a snag in Congress this week after vocal opposition by the American Speech-Language Hearing Association (ASHA) and the American Academy of Audiology (AAA). 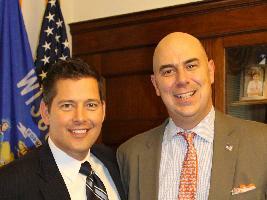 Lead Congressional sponsor Rep. Sean Duffy, left, and Matt Eversmann, national spokesman for Fit to Serve. The proposed legislation, according to its supporters, would enable the VA to hire licensed Hearing Aid Specialists to perform hearing aid evaluations and recommendations, as well as the conduct the fitting, adjustment, and repair of hearing aids. 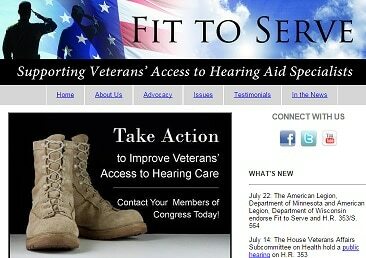 ASHA, AAA and the Association of VA Audiologists (AVAA), however, continue to strongly oppose the legislation. The VA has also been on record to oppose a similar bill last year. Testimony by Madhulka Agarwal, MD, a deputy undersecretary at the VA, indicated that the VA can already use hearing aid specialists if it chooses and that they are already utilizing the personnel best suited for providing audiologic care to veterans. The incredibly long wait times for audiological care at the VA, however, have resulted in growing support for the legislation among many veterans groups and members of Congress. While frustrated by the latest development, IHS hopes that enough support for the legislation will allow it to proceed through congress, despite this week’s setback. No comment from ASHA or AAA was available at the time of this writing. For further background on this story, readers are encouraged to read our previous reports on the developments of the Fit to Serve campaign.